I created this photograph at Springs Preserve Las Vegas during our formal session of our beautiful couple. 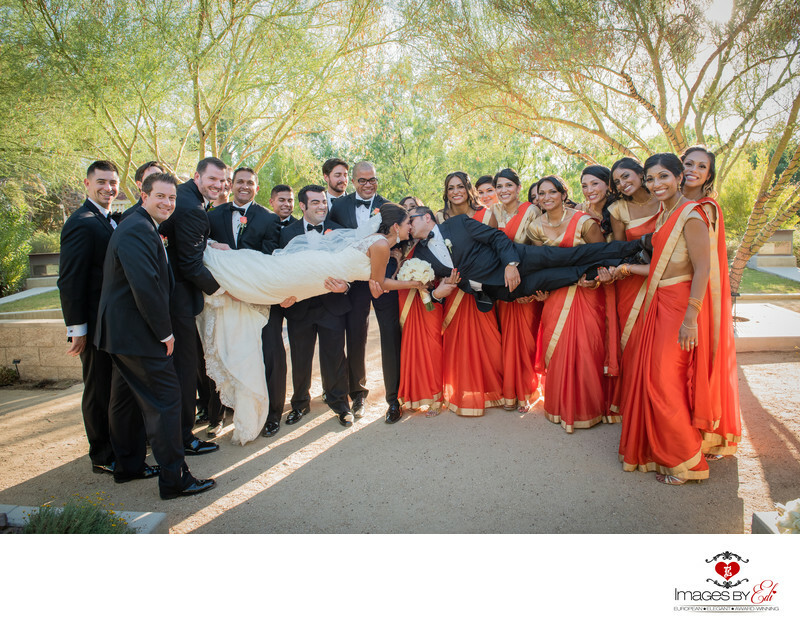 This Indian - multicultural wedding party includes 10 bridesmaids and 10 groomsman, the bride and the groom. The bride is wearing traditional white dress, while her bridesmaids are wearing the traditional Indian dress in orange and gold colors. The bridesmaids are holding the groom and the groomsman are holding the bride while the couple is kissing in the middle. This was an October wedding, when the Las Vegas weather is just perfect and thats why its part of the very popular Las Vegas wedding season. Location: 333 S. Valley View Blvd., Las Vegas, NV 89107 .